Social media has long been seen as a marketing tool by brands - but that only tells a small part of the story. Companies can use social media across the entire organization, solving problems in each department Want to expand your talent pool during recruitment, and strengthen your organization as a result? Turn to social recruitment. Want to gauge sales demand more accurately? Use social to directly reach out to your potential customers. 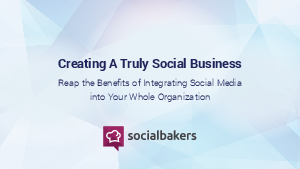 Social has many potential uses across organizations - it just takes an enlightened organization to put them into place. Find out how to start that process with our exclusive report.